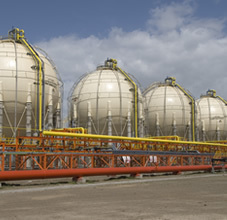 Our credentials in the design and construction of spherical tanks include more than 250 Pressurised and cryogenic spheres for LPG, Ethylene, C2C3, Propane, Butane, Nitrogen, LoX, LiN, Hydrogen and Ammonia service in India & abroad since 1964. This performance slots us amongst the leading Sphere manufacturers in the world. 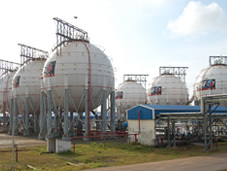 We have pioneered the design and construction of Pressure Spheres in India and continue to drive international spherical tank technology through the creation of patented construction processes and use of computer simulation tools to arrive at more economical sphere designs. Our spheres are designed & fabricated to provide superior levels of integrity, economy and safety through the application of well-researched petal fabrication technologies & welding management systems.